Tart Cherry Salsa Breakfast Tacos + a giveaway! I have a relationship with breakfast tacos. It’s kind of a complicated relationship though, since I never actually eat breakfast tacos for breakfast. I tend to only fraternize with them when I need a quick lunch or dinner. Oh, but then again on family vacations we’re all about the breakfast tacos (for breakfast). My dad is rather skilled in his breakfast taco making. His are the kind where the tortilla is cooked in butter so it gets just barely perfectly crispy and then it’s filled it with bacon and eggs and cheese. For me, it’s what nostalgia tastes like. If there is one addition I could make to the breakfast tacos of vacations past, it’d be the inclusion of an oh-so satisfying salsa. Say maybe a Tart Cherry Salsa made with Montmorency cherries, roasted tomatoes, a touch of jalapeno (cause I’m a spicy food lightweight) and plenty of cilantro. Speaking of cherries, I always thought it’d be the stuff dreams are made of to get married in a cherry orchard. 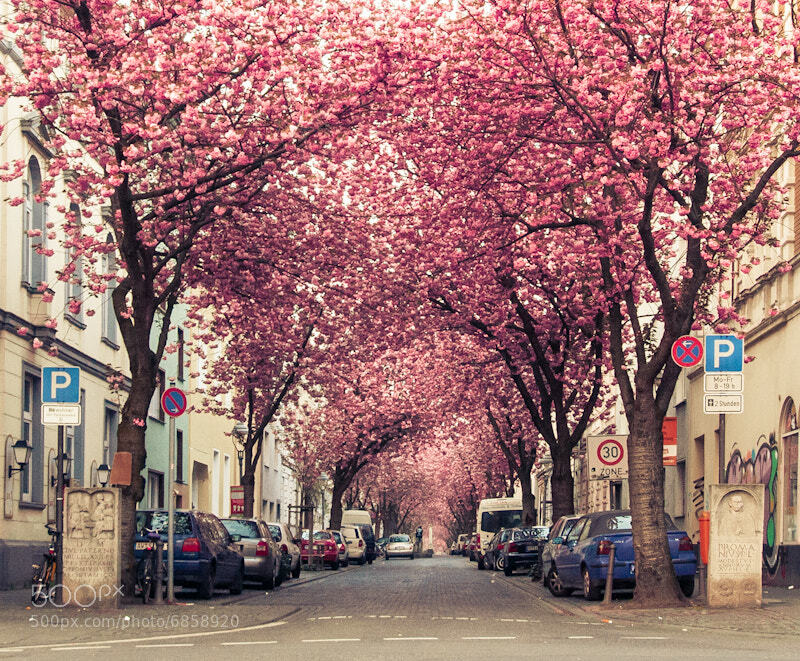 Or at least in a place with cherry blossoms. Like could you imagine getting married here or here. Those might be the same place…someone more cultured and world-traveled than me should let me know. But there isn’t really a plethora of cherry orchards in Houston, so a cherry blossom wedding didn’t seem too realistic. But I totally would have given out bags of tart cherries as wedding favors. Who wouldn’t want a wedding favor that is bursting with anthocyanins, a phytonutrient the gives tart cherries their gorgeous ruby-red color. These little anthocyanins are antioxidants that may be protective of your health. Simply put, sour fruits/vegetables tend to be good for you…case in point, tart cherries. Luckily, tart cherries are a versatile ingredient that easily combines with sweet and savory flavors (just in case you’re not crazy about super tart things). In this salsa, broiling the tomatoes caramelizes their sugars and brings out their sweetness. When the sweetly caramelized tomatoes meet the tartness of the cherries, sweet and savory flavors combine for the perfect breakfast taco salsa. Want to win your very own year supply of tart cherries and tart cherry juice?! (yes.) Want to win KitchenAid Mixer, a Le Creuset Dutch Oven and an Anthropologie Apron?! (yes.) Actually those were both rhetorical questions because pu-lease, who wouldn’t want to win those things. Enter the contest below and you could be on your way to wearing a really cute apron. Preheat your oven's broiler. Line a baking sheet with foil. Place tomato slices, onion and red bell pepper in a single layer on your baking sheet. Broil until starting to get brown and charred, 5-7 minutes. Remove from oven and add to a food processor (or blender) and blend until smooth. Add into the food processor the cilantro, jalapeno, garlic, lime juice, cumin, salt and pepper. Again, blend until smooth. Slice most of the tart cherries in half, however leave about a 1/4 cup of them whole. Scoop cherries into a bowl. Pour tomato salsa mixture into the same bowl. Stir everything together. Cover and refrigerate for at least 2 hours (or overnight) to let the flavors blend together. Serve warm or cold. For the breakfast tacos. Scramble your eggs. Serve warmed corn tortillas topped with scrambled eggs, tart cherry salsa, sharp cheddar and cilantro. I love tart cherries on a huge dollop of Greek yogurt! But I think I would love them this way as well! ooo I need to get on that tart cherries + greek yogurt combination! I would love to add them to my greek yogurt!! I’m thinking in a cherry pie! These look great! I love spin on the salsa! I’ll have to try this soon! I love eating tart cherries in my whole wheat oatmeal pancakes topped with Greek yogurt, more tart cherries, and a drizzle of maple syrup! So good! I would mix them into smoothies with chocolate protein! Can you take me with you to California?! I need warm weather. I also need these breakfast tacos! I love it when tart things go well with savory dishes. I adore anything with cherries so this is going to be a ‘Must Make’ recipe! I LOVE cherry republic!!!!! Around Christmas time they have a booth at a market here in Houston! I always stock up on EVERYTHING: cherry salsa, chocolate covered cherries, cherry jam…so so good. Tacos look wonderful. I’d love this tart cherries on my oatmeal sprinkled with cinnamon. I am all about fruit salsas, but I never thought to put cherries in mine. Yum! Ok, for real, this is brilliant. It reminds me of your jam and egg combos from Instagram. Gots to get me some tart cherries so I can make this now! I am so obsessed with the whole jam + egg sandwich thing! My grandfather had Gout and someone once recommended tart cherry juice- he never found it because it just wasn’t big yet. Love the health facts you give here, and love the apron and kitchen aid ;) and the cherries of course! I hadn’t heard that recommendation for Gout. Interesting, I might pass that tip along to a couple people I know! If you ever get a chance, visit! They have this little restaurant/diner next to their wine tasting room and massive cherry gift shop where EVERYTHING on the menu has cherries incorporated in a to-die-for way… I may need to go visit grandpa early now. I would definitely want to try the cherries in some oatmeal! I love the sweet and savory combo, so I’m sure I’d love this in my breakfast oats! I love cherry season! Another good cherry salsa I love is with balsamic vinegar, red onion and basil – on top of a balsamic grilled chicken breast (got the recipe from iowagirleats). Perhaps some feta or goat chèvre sprinkled on top? I LOVE iowagirleats…just made her Lunch Power Bowls with chicken, pistachios, goat cheese. So good! Yay Cali! My favorite place as well. :P I really only eat breakfast tacos for lunch or dinner also! And it’s such a shame. I love that you threw tart cherries into the mix! I would love to bake them into some cookies! Wow, I’ve never had tart cherries – but I love all of the ideas above! With greek yogurt sounds delicious! We have a cherry shop in Ann Arbor, and it is wonderful. Their cherry salsa is DELICIOUS. THen putting cherries in trail mix, smoothies, oatmeal, with chocolate…I’m gonna crave them so bad after reading this post! Pardon me, while I go make and then bathe in this salsa. What? Is that weird??? Ok fine, I’ll settle for just drinking it with a straw. Anything with tart (or any other) cherries is my favorite!! Erik’s favorite pie ever is three berry pie, which he only gets in Door County, WI…I think it’s like tart cherries, blueberries and strawberries or something. Anyway, I would totes make that for him all the time if I won a YEAR’s supply holy crap!!! I love trying a new flavor of salsa from pineapple, to mango, to hot so tart cherry is next!